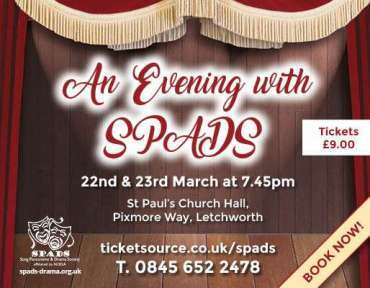 Come and enjoy an evenings entertainment with SPADS. Our annual one act play - short but no less entertaining. You'll also enjoy the talent within our company through our showcase of drama, comedy and musical entertainment. A short play by Emma Northcott: All is not well with Sophie and Tony.When Sarah and Ross arrive to try to cheer them up, events do not go according to plan. Directed by Alan Reilly. Enjoy a drink and refreshments with our bar and table seating. No comments have been posted yet - come back later. If you've seen the show please let us know what you thought about it.